About Friends of Shore Acres, Inc.
WE HAVE WHEEL CHAIRS FOR YOUR CONVENIENCE TO USE AT NO CHARGE. THEY ARE ON A FIRST COME, FIRST SERVE BASIS. PLEASE FEEL FREE TO USE THEM IN THE PARK, BUT PLEASE RETURN THEM TO THE INFORMATION & GIFT CENTER WHEN YOU ARE DONE. Please visit our Information & Gift Center. You will find many interesting items, a large assortment of informative brochures and friendly volunteers to answer your questions. 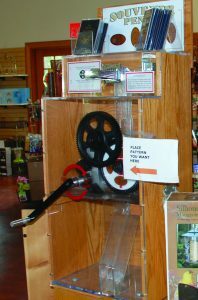 Notice to Vendors: If you have a product that fits with the Friends’ Interpretive/Educational Mission and would like us to consider carrying it in the IGC, please contact Volunteer Manager Lou Kolkhorst at 541-266-8300 or 541-290-2060. Step into the past. The Information and Gift Center (IGC) is designed after the original Simpson Mansion that was located on the bluff where the Observation Building is now, overlooking the ocean. The entry columns are reminiscent of the columns in the Simpson’s garden in the early 1900s. Please feel free to come in and look around, visit with the hosts or select brochures from our wide range of subjects related to our local area. VOLUNTEERS ARE ALWAYS WELCOME AND NEEDED TO HELP US IN THE INFORMATION AND GIFT CENTER – This all volunteer operation is a primary source of funding for many of the Friends’ activities and the Park’s Physical Development and Interpretive Programs. If interested in giving your time, please call us at 541 266- 8300, or click on Contact Us to e-mail your name and phone number or e-mail your address and we will contact you. All net proceeds go back into the park. As volunteers, we get to meet people from all over the world and share our area with them. It’s fun and informative. To volunteer in the Information and Gift Center, please call our Volunteer Coordinator Pam Stevens at 541-572-0739 or 1-541-551-1290. The Information and Gift Center (IGC) carries a variety of items for everyone. For the hiker, we have walking sticks, energy bars, sunflower seeds and candy bars. For the historian, we have many books related to our area. Home schooling? We have books and science project kits. Interested in birds? We have binoculars, feeders, and informative books about care or identifying our local birds. And much more… We have information and houses for bats. We have a wide range of puppets, toys, puzzles and activities for the youth in your family. We have great DVDs showing the history of the park, Holiday Lights scenes set to music and a Holiday Lights screen saver for your computer. We have jackets, sweatshirts and T-shirts, jewelry, purses and much more for your fashion needs. We carry sculptures, soap bars and pine baskets . . . and the list goes on. We now have a new crewneck sweatshirt in sizes Small to 5XL, a Marionberry chocolate bar, sunflower seeds, bicycle bells, backpacks, enamel cups, and yard sculptures. Want to smash a penny? Come in and try our PENNY PRESSING MACHINE. Four designs: 1. Garden House, 2. Pond and Herons, 3. Cape Arago Lighthouse, 4. Oregon State Parks Seal. Drill a couple holes in your flattened pennies and they great on walking sticks . . . or just collect them. We have two styles of Passport Books to keep your collection of pennies in, too. WE CARRY MANY ITEMS MADE BY LOCAL ARTISTS AND VENDORS USING LOCAL PRODUCTS. • Shore Acres scenes on magnets, clothing, mugs and postcards with scenes taken by our supporters and only available here. All of our postcards are produced locally and cannot be purchased elsewhere. • New items arrive weekly. Come see what is new! Comments, questions or ideas? CONTACT US: Telephone/Voice Mail: (541) 888-2472 or 1 866 888 – 6100. • Please feel free to come into the Information and Gift Center to look around, ask questions and visit with the great people who volunteer to make your visit a pleasant one. • DVDs: “Gardens Above the Waves at Shore Acres State Park” (includes Holiday Lights scenes) and “The Shore Acres Story” (the history of Shore Acres). We hope you enjoy the gardens and the park and visit often. Thank you for observing that we are a smoke free park. every night (including Christmas Eve, Christmas and New Year’s Eve. Walk‑thru Display - All abilities accessible. Open Garden House with hot cider, punch, coffee and cookies!